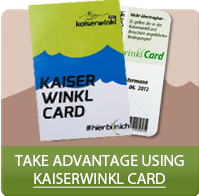 50 km of prepared slopes in the bordering region between Bavaria and Tyrol, accessible with a joined ski-pass for Kaiserwinkl-ski region Unterberg and Zahmer Kaiser. The valley station of the Unterberg lift is 350m from the campsite. A comfortable 6-seat gondala takes up to 1,600 people an hour up to the top of the mountain at a height of 1,700m. The slopes range from blue to black, from 'easy' to 'difficult'. The Kössen skischool and ski hire are next to the valley station, 350m from the campsite. The ski centre Zahmer Kaiser offers 10 different runs. The majority of runs categorized as 'easy'. 4 toboggan runs are also available. If you need a rest, there are traditional ski huts and aprés ski pubs available. Snow guarantee on the north-west side at 1,000m. The cross-country track runs directly past the campsite. Free entry to the tracks with guestcard. A lit night track at the sportsground. Approx. 1,200 m of track is lit up on Tuesdays, Thursdays and Fridays from 6pm to 9.30pm, level of difficulty 'easy'.